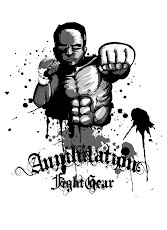 It was a story of new beginnings for Gilbert Yvel, who put a dub in the win column last night at Resurrection Fight Alliance in Kearny, Nebraska. The former UFC heavyweight dropped down a weight class to debut as a 205lber. He defeated a far less experienced Damian Dantibo (now 4-2) via first round TKO due to punches. It was Yvel's first win in four fights following his October 2010 release from the UFC. The Dutch Pride veteran went 0-3 in his short-lived UFC run. But, the drop to light heavyweight could be the ingredient for success for Gilbert Yvel. The main event at last night's RFA event was the opposite of success for another UFC veteran. Jens Pulver just can't seem to get his footing in the cage these days. A vicious knee from Timothy Elliot set up a first round TKO loss for Pulver who has won only three of his last eleven bouts. Pulver debuted at bantamweight for his last fight in August, a move that looked to promise a comeback when he secured a TKO win over WEC veteran Coty Wheeler.